An 18-foot Lund Mr. Pike boat powered by a 115 hp Yamaha motor and an 8 hp high thrust T8 motor, set up with Lowrance locaters, GPS, and a Minnkota Terrova trolling motor. A Tuffy Esox Magnum boat powered by a Mercury 60 hp motor, set up with Hummingbird locaters, GPS and a Minnkota Terrova trolling motor. As an Ambassador with PURE FISHING (http://purefishing.com/), I have access to the most current components in the fishing industry. I only use high quality rods and reels and the best fishing line available. I will match the rods and reels to the baits we use on our outing. This is not a one size fits all sport! You are welcome to bring your own rods and reels if you wish. 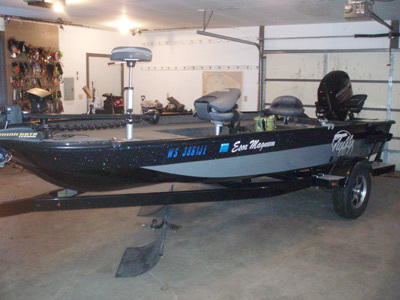 I have the equipment for Musky, Walleye and Crappie. Over the years I have accumulated a wide variety of Musky baits for different times of the year. If you have a favorite/lucky bait you want to bring, that’s fine! I have found that 1/16 and 1/8 oz. slow fall jigs tipped with a minnow are the ticket for Walleye and Crappie. At certain times of the year trolling crankbaits can be deadly on the Walleye.